Let's say I wanted to build a robot to do something really awesome, like make toast or drive in space or fly a rocket crane or something. And I wanted to be able to do that in an expressive, high-level language. I like programming because, as Fred Brooks so brilliantly put it, it makes me feel like a wizard. You sit at a terminal, type a few arcane and idiosyncratic incantations, and suddenly this machine does things. That's cool. But I want to be able to build things faster. Here's the thing - and I know I'm something of an anomoly here - I don't actually like programming. I like making things. I like being able to see the result, sharing things with people, and doing zany or useful or silly or amazing or trivial things. But i dont like typing things. One of the things I love about code is the ability to change things. I have very little tolerance for idle bitching. Unfortunately, I also tend to complain a lot. Maybe not complain, but criticize, in the sense of identifying things that could (and should) be better. I'm not always a very happy person, because I see so much badnesss around me. But then I give myself the power to change some of it. I heard a crazy and seditious idea last night - to start publishing tons of C modules to npm. At first that sounded crazy: native modules are evil, etc, etc. But why not? There's an argument to be made that having a common implementation language is better for encouraging community contributions. But most modules, I would contend, are written in whole or in large part by a single author. We shouldd acknowledge and embrace this, and realize that the really interesting things we should care about are tiny piece of functionality - especially domain-specific things. We don't need another damn templating language - we need fun things like math and science modules. It shouldn't matter if someone wants to write in R or Fortran. The biggest platform advantage we can have is fostering the incredible environment of code reuse and productivity, built on top of the right abstractions and interoperability. Rather than promoting some perverse and conformist orthodoxy, I want to be a crowded bazaar at the intersection of exotic trade routes going to every far flung corner of the internet. I want to encourage mad hacking for its own sake - just to see what we can make. I want us to adopt creative and generative constraints, and discard traditional ones. Color outside the lines. Mostly, I want to look out at the world around me and see everything as mutable, as hackable, and continuously improveable. I want to be able to see the world like Neo from the Matrix - and I want to help others see the world this way, too. Some people ask me why I'm not doing my own startup. And the answer is I'm sure I will eventually - but not right now. For me, it's not about a big exit, but a big impact. There is a number of things that I could be doing with my time, including scrambling together a team to attack an idea largely for its own sake. But ultimately, I want to be im a place where I can tackle large ideas. That's how I approach my deicions right now: will this course of action position me to work on things that matter and make a difference in people's lives? Right now, that path is software engineering. But importantly, I want to focus my efforts on the top layer, the membrane between the electronic bits and actual humans. The part that people see, touch, experience. If I do my job right in this area, they won't even notice the interface, but they'll experience joy, accomplish their tasks, or gain new understandings of themselves and the world around them. The technology is cool and shiny, and it's easy to get caught up in that, but I'm serious when I say the technology is only a means to a very human end. So, the interface is what I want to create. But where do I want to do this? In his book The Passionate Programmer, Chad Fowler compares the career of an engineer to that of a musician. Growth requires practice, but moreover it requires collaboration and feedback with people better than you. Specifically, he advises "always be the worst player in any band you're in". In developmental psychology, there's an idea called the zone of proximal development. This is the area of skills and knowledge that is just beyond your present level, and its this knowledge which is most engaging. Since it's similar to what you already know, you have a good foundation for developing the relations between concepts and facts. Since it's new material, it expands your knowledge and skills. The key then is to stay in this zone, to constantly push to take on new challenges, technologies, problems, in a way that builds on your existing experiences. I feel I'm a pretty competent programmer, and I pick up on new concepts very quickly. Thus, my imperative is to surround myself with committed, passionate software players and creators. I want to be part of a world-class, high-impact, high-performance team. In service of the ultimate goal of working at the problem level - which will require a mix of technical, analytical, social, and business skills - I must seek out the best possible team in which to grow, learn, and contribute. Finding the right team is tricky. Great teams can only truly thrive in organizations with certain traits: Trust in team members over processes. Value people as a whole, not as a templated, arbitrarily-tilted job description. Encourage both internal and external communication of a shared vision, even at the expense of giving up some nominal control. Everyone should be empowered - and expected - to articulate the overall vision of the organization and understand how it relates back to their daily work. The Adam Pisoni, Co-Founder and CTO of Yammer, gave a talk recently where he characterized heavily bureaucratic and process-driven organizations quite well. In these organizations, he says, "you won't do it wrong, you also won't do it better." This kind of aspiration to mediocrity is fundamentally antithetical to my world view. I want to move people forward. So, I made the plunge. The Retina display MBP was just released. I ordered one the day it came out, and it got here about 10 days sooner than I was expecting. But there's one small problem: I've never owned a Mac before. Sure, I've used one on a daily basis before, and I've given tech support for them on more than one occasion to friends and family. But now I've got a problem: I know my way around Windows backwards and forwards. I know it's inner workings, and I have all the keyboard shortcuts memorized to an instinctual level. It's my first 72 hours with a Mac, and here are my impressions and tips to getting back up to speed as soon as possible. Let me get this out of the way. Feel free to skip this section. I use computers for a far larger proportion of my day than could possibly be healthy, so it's worth it to me to invest in the best possible hardware. It's funny how emotional some people can get in defending their technology choices. Mac vs PC vs *nix. The most common knock I hear against Macs (and I've repeated this line myself) is that they're overpriced. Well, sure they're more expensive than a commodity PC, in the same way a Lexus is more expensive than a Kia. They both turn on, they can both drive on the same road, but one will afford you some more creature comforts, have better design and engineering, and give a better experience overall. Is than intangible difference worth it to you? At the end of the day, they're both cars, or they're both computers. So go with what you like. In Windows, the Control key is king. In OS X, it's Command. In fact, changing most of your Control keyboard shortcuts to Command will work fine. Common examples include Command + C to copy, Command + V to paste, Command + X to cut, Command + S to save, and Command + Z to undo. Just as in Windows, Command + W will close a tab in a tabbed application. To close an app, it's Command + Q, whereas in Windows it would be Alt + F4. To cycle through visible windows, Command + Tab works just like Alt + Tab. Also try the three-finger swipe up gesture to show all windows in an overview mode, with windows form the same Application grouped together. Three-finger swipe up again to return to your current application, or click a window to bring it to the front. Option + Left or Right: move the cursor left or right by a whole word. Equivalent of Ctrl + Left or Right on Windows. Of course, holding down Shift at the same time selects text in that direction a word at a time, and Delete deletes text a word at a time. Fn + Delete: deletes text to the right - equivalent of the Windows Delete key. The regular OS X Delete key deletes text to the left, like the Windows Backspace. You can use this in combination with other modifiers to delete a word at a time to the right: Option + Fn + Delete. On Windows, you'd need special software to define system-wide custom keyboard shortcuts. In OS X, it's as easy as going to System Preferences (Apple Icon in the upper left -> System Preferences), Keyboard preferences pane, and clicking the Keyboard Shortcuts tab. Here, you can remap existing shortcuts, or go down to the Applications item and add your own. Enter the name of a menu item and map it to a keyboard combination, and any application with a menu item matching that name will automatically have that keyboard shortcut enabled. Windows 7 was great because it introduced a great keyboard-friendly launcher built into the start menu: mash Windows and start typing, and you could launch apps, directories, or files. Of course, this feature came out in OS X earlier. No matter. In OS X, it's called Spotlight, and you get to it by typing Command + Space. Use it early, use it often. Knock yourself out. This is where it gets cool: once your application is in full screen mode, you can three-finger swipe left and right to move between that full-screen application and the rest of your desktop. Whereas in Windows, alt-tabbing out of a full screen application often takes it out of full screen mode, in OS X it's really easy to keep a text editor in full screen view, for example, and swipe over to context switch when necessary. You can also three-finger swipe to the left from your main desktop view to access desktop widgets, which seem like they're on their way out in OS X Lion, but can still be handy for a quick glance at the weather, traffic, filght tracking, or other passive information. Seriously. Coming from Windows, the best gestures I had on my laptop's touchpad were two-fingered scroll. Here, I'm taking advantage of two-finger left- and right-swipes to navigate backwards and forwards (in both Safari and Chrome), five-finger splay to easily access my desktop (Windows + D in Windows-land), and of course, buttery smooth two-finger scrolling in both dimensions. OS X Lion defaults to direct scrolling: moving your fingers down moves the contents of the window down. At first, it's opposite form what you might be used to, especially using the scroll wheel of a mouse - but you quickly realize it's the same as on a touch screen device, like a phone or an iPad. If you don't like it, you can go back to the old way in System Preferences. Command + Control + Shift + 3 (yes, really): Take a screenshot and copy to clipboard (equivalent to Windows Print Screen). In fact, using Control in combination with the other commands copies the result to the clipboard instead of saving an image to the desktop. 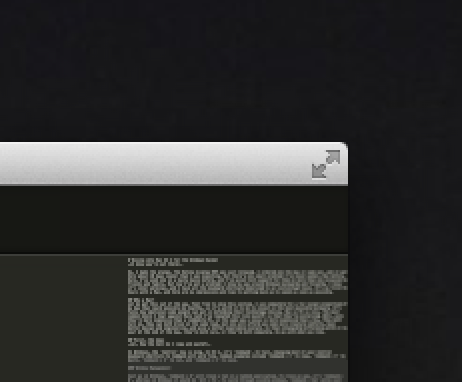 One of the best parts of OS X is that you have a real *nix terminal under the hood. Mash Command + Space, term, Return and you're in a real bash shell, in your home user directory. I love that Command + Plus or Minus still works to adjust the font size, and the Preferrences screen (universally accessed in OS X apps with Command + ,) lets you tweak out every other aspect of your Terminal: fonts, transparency, tabbed windows, and shells. Get comfy with Terminal, and use it as much as you can. Get back to your hacker roots, and kiss Windows' lousy CMD goodbye. I'll continue to post tips and tricks as I come across things that are especially useful. I still think Windows Explorer and the Windows File Open and File Save dialogs are better than OS X, but I expect that's just because they're more familiar to me. In the mean time, I've got Windows 8 running in a VM for Visual Studio and some other Windows-only utilities that I use. Got a tip? Post it in the comments, or reach me @leJDen on twitter. With that out of the way, I have been meaning to write more and share longer-form ideas. Twitter is well and good, but it’s a very passive form of creation. With a blog, I hope to take advantage of a longer format to better articulate my ideas and solicit more meaningful feedback. There’s no real content in this post. Thanks for your attention anyhow.